In the early 1990's the Kirby Health Center, led by Alan Kirby and Dr. John Turner, carefully considered the issue of homelessness in Luzerne County. Their findings indicated there indeed was a problem, yet important gaps existed in terms of how the problem was systemically and fundamentally addressed, especially - when it came to the issue of family separation during times of community intervention. In stark contrast to the quick fix, ineffective, short term solutions that sometimes existed other approaches to the problem, their goal was to build a homeless living facility founded on 2 principals. The first principal was that families entering the home would be held accountable in identifying and tackling the long-term, systemic, and sometimes complex issues which are the root of their homelessness. The second principal is that, during this transition, it is paramount the entire family stay together. They needed a partner who had the expertise, heritage, infrastructure, and access to our community's human services which would be vital in helping families permanently overcome their homelessness. Perhaps more importantly, they also needed a partner who shared the same vision and values as to how to systemically address the issue of rehabilitation. The partner they chose was The Salvation Army. 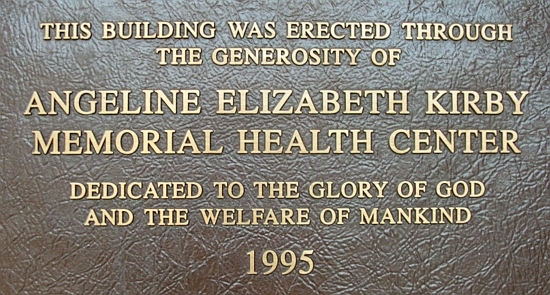 Working in tandem, the Kirby Health Center and the Salvation Army built this premier facility in 1995. Immediately afterwards, The Salvation Army assumed all responsibility for the day to day operations, including, property management, human services, education, counseling and importantly, the financial obligations of running the House. Why is maintaining the family so important? In many cases, traditional homeless services separated the family unit. This was the critical gap identified in many other prescriptions of the homeless problem - to receive the needed services, children were sometimes separated from one or both parents, and husbands and wives could be separated too. The Kirby House provides a haven for the entire family as they receive needed social services, and begin rebuilding their lives. This approach breeds stronger family bonds and is part of permanent non transitory solution. But providing a solution to a homeless family is more than building strong values. The Kirby Family House provides a combination: counseling, education, training and the coordinates the various human services available in the Wyoming Valley. Undergo a rigorous orientation in which the expectations and requirements are explained. Surprisingly and sadly, there are some who feel that the demands and requirements of the Kirby House Program are too strict and choose not to stay. Most, however, recognize the depth of services available and the opportunity for a new beginning. Residents are also required to make daily contributions to communal life in the House. (primarily, cleaning, and maintenance) intended to help instill a sense of ownership in where they live. Residents also agree to save least 70% of all income on deposit in an escrow account with The Salvation Army until they are prepared to move on to their own permanent housing. Funds are used to pay off personal debt and to address other financial needs in a fiscally responsible manner. Attend Continuing Education Classes such as parenting, nutrition, etc. Residents are able to come and go as they please, but with specified curfews. Residents gain more privileges (such as more liberal curfews) as they demonstrate measurable progress and responsibility. Through a combination of intense counseling, social services, and "tough love," residents gain a stronger value system and life management skills which results in residents becoming better equipped to lead secure, healthy, productive lives. Many success stories exist of homeless parents who enter the program destitute but leave with some money, life skills and the confidence they need not become homeless again. By design, requirements for staying in the Kirby House are indeed demanding. The funds you contribute are not a hand out, but a "hand up" by providing tools that help families to help themselves. In the final analysis, the work done at the KFH gives children the gift of better parents and parents the hope that their children will have a brighter future. The Salvation Army thanks you for your generous support.